Last week I had planned on making a salad with buffalo chicken and blue cheese. But that day, it ended up being very cold and windy, and I just wasn't feeling like eating a salad. I wanted something heartier, but still with the buffalo flavor since it had been on my mind for 2 days. 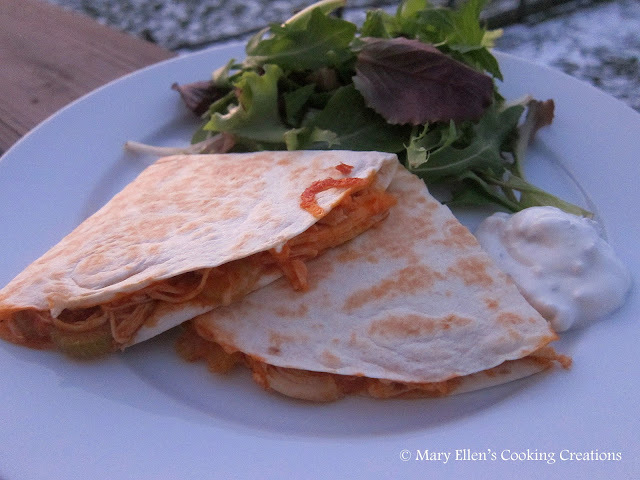 I sat in the parking lot of the supermarket searching for a quick and easy recipe, and came across this one for Buffalo Chicken Quesadillas on the blog I Will Not Eat Oysters. Quesadillas... hmm. That's not usually the type of thing I make for dinner, maybe lunch. But they sounded so good, and I figured we could still have a side salad with them, so I ran in and bought some blue cheese and tortilla shells and decided to give them a shot. Now these are easy, but they do require 4 different pans to prep and cook them... Jon wasn't too happy with the dishes that night. BUT - this IS the kind of recipe that can be prepped in advance. Make the sauce, dipping sauce, and cook/shred the chicken the night before, and you have a really quick and easy meal to throw together on a weeknight. I didn't tell Jon what I was making until I put a quesadilla on his plate and said "try it." After eating it and liking it, he admitted that if I would have told him we were having Buffalo Chicken Quesadillas, he would have been wary of them. I'm glad he did, because I really liked them and look forward to making them again, either for a quick dinner or a fun appetizer at a party! I made several changes, so my adaptation is below. 4 stalks celery, sliced thinly - I really don't think these were necessary in the quesadillas. I would have rather had celery sticks on the side. 2 chicken breasts, cooked and shredded - I poached my chicken and then shredded it. Make the hot sauce: In a small sauce pot over med heat, melt 2 tbsp butter. Add the flour and mix with the butter. Cook, stirring, for about a minute to cook out the flour taste. Add the hot sauce and vinegar, and let the sauce heat but not boil for 4-5 minutes, stirring constantly. Set aside, or store in an air tight container in the fridge. The dipping sauce: In a small bowl, mix the sour cream and blue cheese crumbles. Cover and store in the fridge. The chicken mixture: Heat the olive oil in a skillet or large pan on med-high heat and add the celery, if you are using it. Sweat until celery is slightly soft and darker in color. Add the shredded chicken and season with salt and pepper. Turn the heat down to med-low and add the buffalo sauce. Cook together, stirring, for about 5 minutes. Make the quesadillas: Place a nonstick pan over medium high heat. Add the tortilla and cook for 20-30 seconds per side. Add chicken to one half of it, top with shredded cheese and then blue cheese. Fold the empty side of the shell over to "close" it. Let cook until crispy and slightly browned, and then flip to cook the other side. Slice and serve with the blue cheese dipping sauce.